We are a full service convergence marketing agency located in Chicago. We help companies build precise messaging to reveal joy and depth and value in their brands. Over the last fifteen or so years, we’ve had the chance to work on technology, print creative, photography, website design, database intelligence, and marketing strategy for thousands of projects. Our approach allows you to activate an elite cross-discipline marketing team without the overhead of multiple agencies or drain on in-house resources. We can build beautiful websites and thoughtful social media campaigns. We can shoot action and product photography or both. We can execute tactical outreach, coordinate direct mail, name new products, write press releases, make catalog copy sing, and assemble stunning marketing materials. We can also code and analyze sales data. We can build marketing maps to ensure your project stays on track and returns a measurable result. We would walk over hot coals to meet a deadline for a client. Click here for our key areas of expertise. 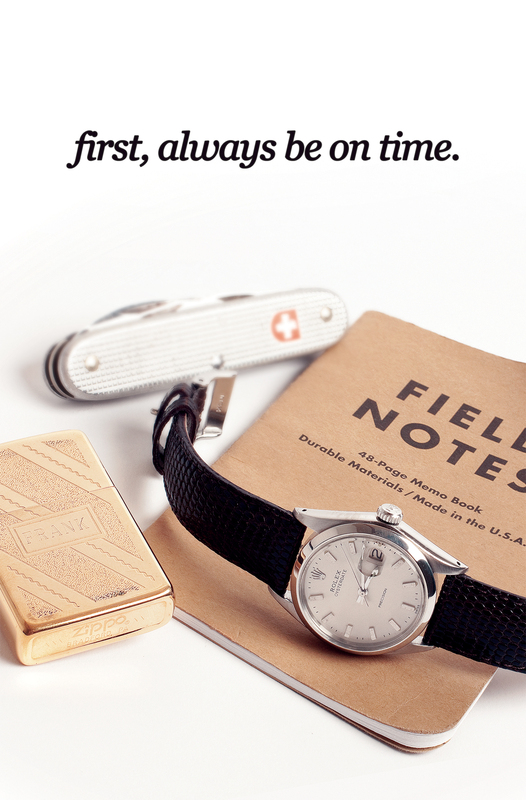 First, Always Be On Time. Second, take good notes. Third, if you carry your grandfather’s Zippo, do the quality of work that recalls his determination and goodwill.